Still looking for a suitable Spring and Summer Outdoor Activity? Prague offers loads of things to do; over kayaking the river, playing beach volleyball down on Náplavka or skating and hiking the area. 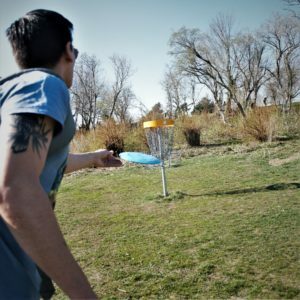 If you are looking to move your legs a little but do not want to end up all too sore, maybe consider giving Disc Golf a try. Disc Golf – sometimes also called Frolf – is a sport in which players throw a frisbee (or disc) at a target. The sport was invented in the early 1900s, in Saksatchewan, Canada, by a young man and his school buddies. They made a game out of throwing tin lids into circles that were drawn into sandy patches. Modern Disc Golf started in the early 1960s – where, that is still an argument between the competing countries. As the name itself might imply, this sport has a lot in common with Golf – but is way more exciting and less equipment-heavy than its namesake. Just like in Golf, Frolf is usually played on a course of 9 or 18 holes. Not just the name has been taken over from golf; many of the rules apply, too. Disc Golf is played in over 40 countries and there are over 100’000 members registered with the Professional Disc Gold Association worldwide! Can so many people be wrong about a sport? 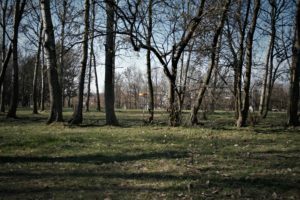 The rules of Disc Golf are pretty straighforward. You start off at a tee area and throw your disc. Throwing again from the landing position of the disc until the target is reached, you might end up walking a lot more than following a golf ball, as the wind has a big part in the play, too. It is exactly this that makes it more fun, though and probably also motivates newcomers to start with the sport. If you mess up, it is still pretty good fun. Just like golf, the number of throws until the target is reached are counted and the goal of the game is, to complete each hole – and with that the whole course – with the lowest count of total throws (also referred to as par). Unlike its big brother, Disc Golf needs very little equipment. That means no carrying around a whole set of drivers and putters all day long. 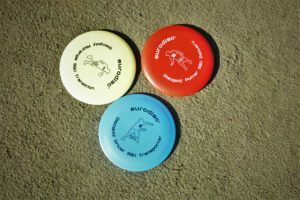 While you could play Disc Golf with just a normal Frisbee, professionals use three different kinds of discs that have been developed particulary for certain distances. The Driver is usually used for the first throw – as it is constructed to fly further than the other two discs. You can either put four fingers on the bottom rim and the thumb on the top or just use two fingers on the bottom rim. Then point towards your target with your back hand. A thing to consider before you throw: The disc will fly in the curve of your arm, meaning that right handed people will probably be throwing a left curve and vice versa. When you find that you made it over half of the distance, you might want to change in your driver for the Mid-Range disc. Especially good for throws that are just a tad too far for the putter, yet too close for the driver to come into play, this usually green disc might save your play, as it has slighty sharper edges that cut through the air better. As you get closer to the basket, you might want to change your grip a little bit, too: Simply put your index finger on the rim for better aiming. When it’s time to put, change for the smallest disc in your set: The Putter. These discs were designed to fly straight, predictably and compared to the other two discs very slowly. Got it? Then onto the next hole! 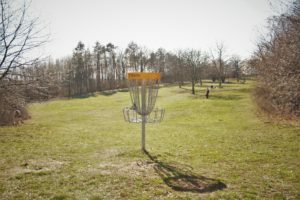 You can either order Disc Golf equipment on Ultimo.cz or – if you do not want to make too much of a commitment until you are convinced – rent them from rental points on the course. Even though you would not expect it, Prague is a paradise for Disc Golfers. The city offers 6 courses all around the capital, with different difficulty levels and sneaky obstacles to throw around. 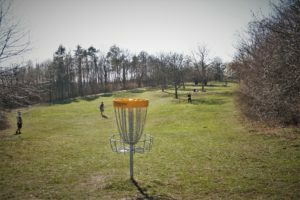 The biggest and probably also most difficult course in Prague 9 offers over 1 kilometer of Disc Golf Fun. You can rent equipment there or bring your own. Accessing the course is for free. This course is the neighbour of the shopping mall in Štěrboholy. It is perfect for beginners, though some of the holes are a little tricky and need the right throwing techniques to get the disc in. The course is 512 meters long and – as most courses – for free. You want to do a classic 9-hole-course minus a lot of walking? 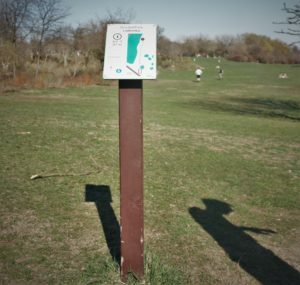 Chodov’s Disc Golf course offers 9 holes on 574 meters, so even less keen walkers will want to join in on the fun! If you need to rent equipment, you want to turn to the restaurant in the center of the park. If you are looking to start off with a little less commitment than 9 holes, you might want to try the course in Centralni Park near Stodůlky metro station. 4 holes on 251 meters and 12 par offer the perfect spot for beginners to intermediate players. Looking for a challenge? Then you want to visit Krejcarek’s Disc Golf Course. You will have play through 6 holes and aim for no higher than 18 par on the 336 meters long course. Good luck! You can rent your equipment at ULITA, near the children and youth center. A nice and widespread course in the midst of Ladronka park. The course comes in two parts, the first hole waiting around the corner of the restaurant in the middle of the park. 9 holes and 868 meters await you. But beware: There are people sunbathing in the middle of the course, so make sure you aim right! Speaking of: Why not treat yourself to a beer after you finish the course? This is an intermediate course and rental equipment can be found near the restaurant. Why Start with Disc Golf? The cost of this hobby is next to nothing; the only thing you really need is a frisbee (or professional discs, if you are aiming for the real thing). Courses in Prague are free and the rent for the disc very low. 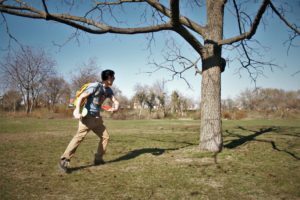 Disc Golf challenges you mentally and physically: Without even knowing, you will find yourself covering more than 1.5 kilometers (or more, depending on how far off your disc went) each time you finish a course. Also, there is a lot of mental activity going on: measuring the distance, keeping balance and aiming for the right direction challenges you in a way you would not expect it to; sharpening your mind and focus in life but also your strategic thinking capabilites. It’s a fun way to get excercise: Have you ever seen someone laughing and giggling when working out in a gym? You will definitely see people do exactly that on a Disc Golf course. 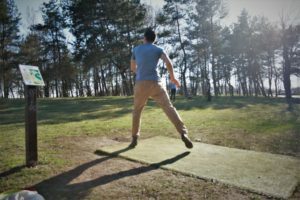 Despite what you might think, Disc Golf is a quite demanding physical activity. It’s a quicker game than golf: It might be because discs are easier to aim or because golfers just like to chat and hang out on golf courses a little too much. Fact is: A round of Disc Golf is over way sooner than a round of golf is. So you can go and play a round and still make it to other plans the same day. The People: Disc Golfers are real fun and nice people. They will let you pass them if you appear to be a quicker player and help you throw the discs right if you don’t know how to. Convinced? Check it out yourself and maybe find the perfect Summer hobby for you! 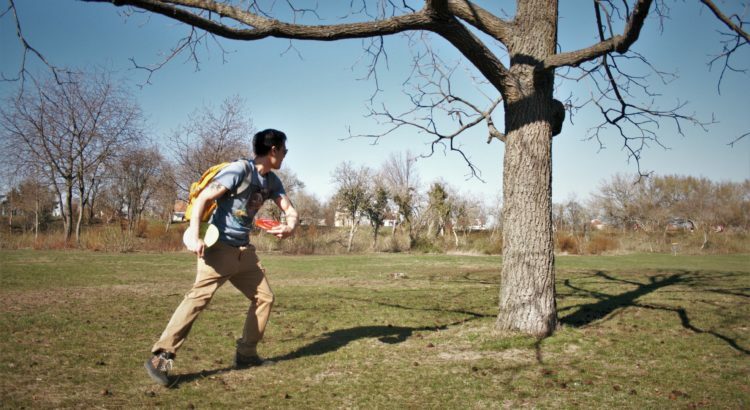 Have you tried Disc Golf before? Are you maybe even a professional player? Which is your favourite Disc Golf Course to go to? We want to hear all about it in the comments! Happy Gol… Frolfing!